SlideshowThe Phragmites extend for thousands of feet out into Saginaw Bay, as viewed here from the Quanicassee Nature Preserve. Phragmites have been spreading with the lower average water levels of the last 20 years. SlideshowAn aerial view of Saginaw Bay shows the skirt of Phragmites fields along the shoreline. SlideshowKayakers can float over the once exposed grasslands in Saginaw Bay and observe the intermingling of Phragmites and Typha at the ever-fluctuating edge. SlideshowHigher waters in the spring of 2014 re-inundate the Phragmites fields; Sand Pipers feed along the shore. SlideshowOn opposite sides of the Hampton Township Nature Trail, near Saginaw Bay, we see the juxtaposition of two grasses: cultivated corn on the right and invasive Phragmites on the left. SlideshowEmergent lands at Saginaw are bolstered by the sediment and phosphorus outputs of the many small canals used for agricultural field drainage. SlideshowJust west of the mouth of the Saginaw River, residents have taken it upon themselves to mow the emergent lands in their backyards and cultivate grass, transforming this coastal marsh into a homogenous lawn. SlideshowBay City State Recreation Area, one of the largest coastal marshes in Saginaw Bay not overrun by Phragmites. SlideshowAt Leelanau State Park, on Traverse Bay, Lake Michigan, a rocky grassland that had emerged over decades of low water levels is now re-submerged as the lake rises again. SlideshowA typical scene along the Eastern shores of Grand Traverse Bay: the dance of dock extension with changing water levels. SlideshowEmergent shorelands on Traverse Bay enlarge the backyards of homeowners. SlideshowIn time, low water levels allow the establishment of woody species. SlideshowThe low waters of summer 2013 yet again found Traverse Bay residents extending their private docks. SlideshowA variety of private access and armor strategies can be seen in the town of Port Huron, Michigan, on the St. Clair River. SlideshowA new waterfront park in Port Huron attempts to utilize legacy infrastructure to provide protection from the highly variable river conditions. SlideshowPearl Beach, Michigan, sits along the shallow delta of the St. Clair River, the largest freshwater delta in the world. These constructed channels are continually dredged to maintain private water access for residents. SlideshowIn many locations, citizens manage the edge condition of the lakes on their own. Here in Green Bay, on Lake Michigan, riprap is used to create a large private lawn. SlideshowThe privatized residential edge of Green Bay shows large clumps of exposed land far beyond the riprap armor that marks the historic water line. SlideshowOn the western shore of Green Bay, a small local park moves forward with outdated plans to extend the lawn down to the water’s edge even as lake levels rise. SlideshowCulverts that control the water at the Pointe Mouillee State Game Area, Michigan, index past water levels. SlideshowPointe Mouillee State Game Area. SlideshowNorth of Toledo, Ohio, decades of low waters have taken their toll on a private harbor where the expense of dredging and maintenance made it increasingly difficult and expensive to maintain the infrastructure. SlideshowRust lines on the docks indicate past water levels. SlideshowA newly exposed island in Georgian Bay, Lake Huron, hosts a picnic table. SlideshowThe large, shallow Georgian Bay is particularly susceptible to water level fluctuation. Here boats sit in a continually-dredged slip across from an emergent wetland. SlideshowBehind this for-sale sign, an expanse of emergent land stretches into Georgian Bay. SlideshowThe Detroit River connects Lakes Huron and Erie. The modification of this stretch of water is one of the suspected causes of decreased lake levels in Lake Michigan-Huron. John Dingell Park, Detroit. SlideshowA winter seiche in Buffalo, New York, tosses ice across the pedestrian zones of La Salle Park. 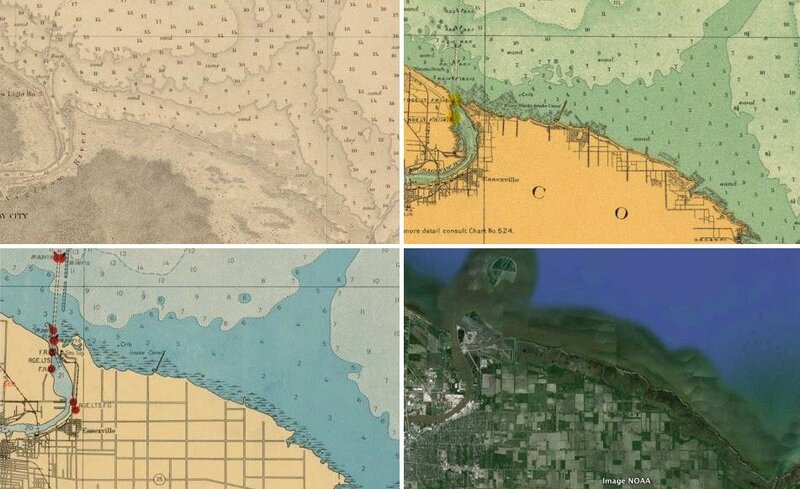 The changing shoreline of Saginaw Bay, in 1860, 1919, 1945, and 2014. Historical maps of Saginaw Bay, on Lake Huron, show how dramatically the coastline can shift even with small changes in water levels. Around the Great Lakes, cyclically emergent shorelands reflect the complex exchanges between fluctuating lake levels and adaptive land use. In the ruins of abandoned docks and the invasion of 15-foot tall Phragmites australis, we can read a history of past occupation and management techniques. We find retaining walls and other ill-conceived fortifications designed to generate predictability within this unpredictable zone. But it can be difficult to observe the lake fluctuations in real time, or even to imagine alternate conditions. Where the water levels have been low for years, the exposed shore now supports large shrubs and trees that create an illusion of permanence. In this slideshow, we document emergent shorelands at a particular point in time; they are soon to be overtaken by rising waters and melting ice. The inherently ambiguous condition of these lands means that they are often seen as nuisance zones that resist our attempts at coastal control and occupation. 3 And yet the very factors that make these lands difficult to appropriate also make them well suited for habitat provision, water quality management, and other beneficial uses. Containing 20 percent of the world’s surface fresh water, the Great Lakes are an immense resource that will be even more valuable in the coming era of water scarcity. In a heavily urbanized region that has lost over half of its wetlands and much of its publicly accessible shoreline, 4 cyclically emergent shorelands are sites of possibility for landscape designers and planners. The Great Lakes Water Level Dashboard. See Andrew D. Gronewold, Anne H. Clites, Joeseph P. Smith, Timothy S. Hunter, “A dynamic graphical interface for visualizing projected, measured, and reconstructed surface water elevations on the earth’s largest lakes,” Environmental Modelling & Software, Vol. 49, Nov. 2013, 34–39. Sara C. Pryor and Donald Scavla, et al., “Chapter 18: Midwest,” Climate Change Impacts in the United States: The Third National Climate Assessment, Jerry Melillo, Terese Richmond, and Gary Yohe, Eds., U.S. Global Change Research Program, 418-440. Kenneth Kilbert, “The Public Trust Doctrine and the Great Lakes Shores,” Cleveland State Law Review, Vol. 58, No. 1, 2010. U.S. Environmental Protection Agency, State of the Great Lakes fact sheet, 2006. 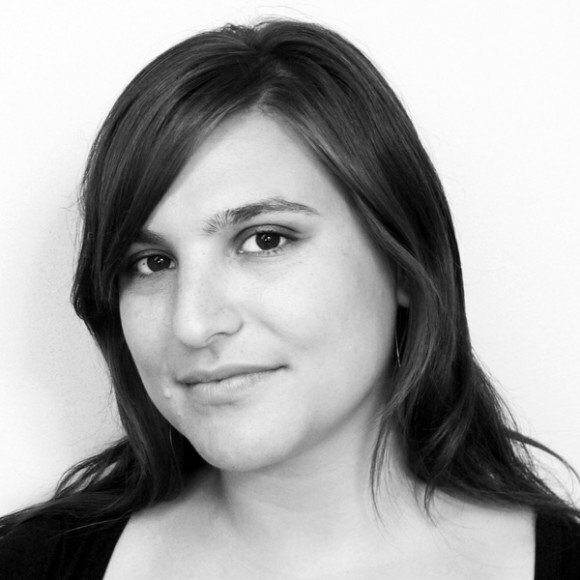 Karen Lutsky is an assistant professor of landscape architecture at the University of Minnesota. 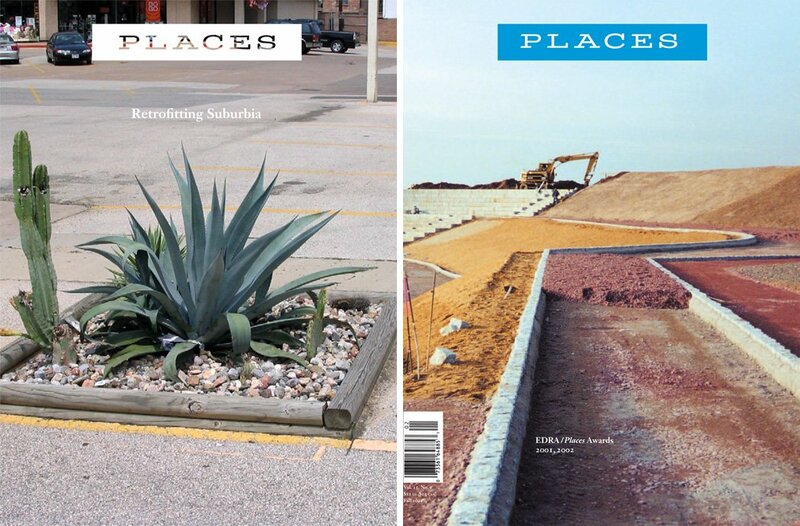 Sean Burkholder is Assistant Professor of Landscape Architecture at the University of Pennsylvania.